Born in 1956 in Southern India, Sri Sri Ravi Shankar was a gifted child. By the age of four, he was able to recite parts of the Bhagavad Gita, an ancient Sanskrit scripture, and was often found in meditation. At the age of seventeen in 1973, he graduated with degrees in both Vedic literature and physics. 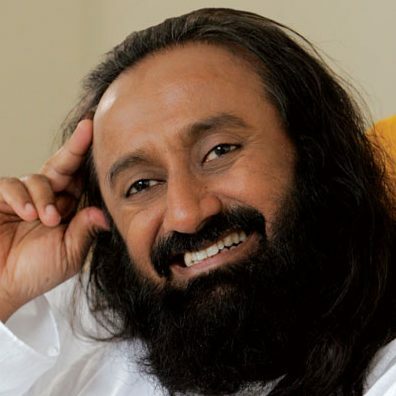 In 1982, Sri Sri entered a ten-day period of silence in Shimoga located in the Indian state of Karnataka and in that silence, Sudarshan Kriya – a powerful breathing technique – was born. It was then that Sri Sri founded The Art of Living Foundation as an international, non-profit, educational, and humanitarian organization. The educational and self-development programs of the Art of Living Foundation provide powerful tools to eliminate stress and improve well-being. These programs include breathing techniques, meditation, yoga, and practical wisdom for daily living which have helped millions around the world to transform their lives. Sri Sri has rekindled the traditions of yoga and meditation and has offered them in a form that works in the 21st century. By reviving ancient wisdom, Sri Sri has created new techniques for personal and social transformation. Today, he is one of the most respected spiritual leaders in India. His official Web site is here.